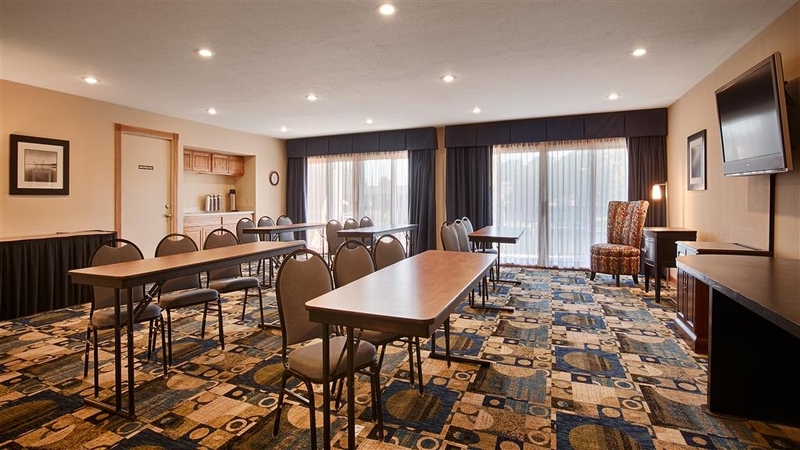 El Best Western River Terrace se encuentra en el centro de Cheboygan. Venga y disfrute de las mejores atracciónes turísticas cerca de nuestro hotel. Precios bajos garantizados y ofertas exclusivas. Escoja este hotel de Cheboygan, Michigan, con unas hermosas vistas al río y un cómodo acceso al Lago Huron y la Isla Mackinac. 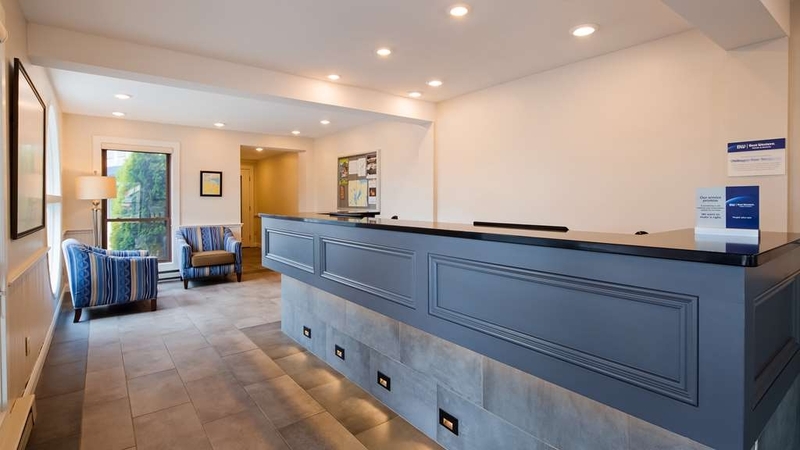 Ubicado junto al pintoresco río Cheboygan en el norte de Michigan, el Best Western River Terrace está comprometido a proporcionar lo mejor en servicio de atención al cliente y habitaciones a un precio asequible. Todas las habitaciones de este hotel del área de Cheboygan están amuebladas de forma muy completa e incluyen televisión por cable vía satélite y acceso a Internet de alta velocidad. Los huéspedes del hotel podrán disfrutar de una serie de servicios e instalaciones entre los que se incluyen desayuno continental de lujo gratuito, piscina cubierta climatizada y bañera de hidromasaje, gimnasio, muelle para barcos y servicios limitados de negocios. Se admiten mascotas (solamente perros) con restricciones. Ubicado a sólo 1,5 kilómetros del Lago Huron, el Best Western River Terrace ofrece un cómodo acceso a una gran variedad de actividades al aire libre entre las que se incluyen pesca, ciclismo, kayacs y paseos en barco. Durante los meses de invierno los huéspedes podrán disfrutar de una magnífica pesca en hielo, esquí de fondo y recorridos en moto de nieve. Los huéspedes que se alojen en este hotel de Michigan podrán disfrutar de las cercanía a las principales atracciones de la zona, como son el faro Cheboygan Crib, el Parque Estatal de Cheboygan, el Hospital Memorial de Cheboygan y el puente Mackinac. A sólo 19 kilómetros de distancia, los huéspedes podrán visitar la hermosa Isla Mackinaw y Fort Michilimackinac. Este hotel ribereño también proporciona un cómodo acceso a eventos locales como el Festival Wanigan, la feria del condado de Cheboygan y el Riverfest. El personal cordial y eficiente del Best Western River Terrace está listo para proporcionarle una estancia inolvidable y llena de diversión en Cheboygan, Michigan. ¡Haga su reserva hoy mismo y ahorre! I have to say, staying at the Riverview BestWestern, was definitely a good choice. Very clean rooms, which were recently renovated was excellent. Heater was great in our room as we were in colder temps than normal. Melissa was very accommodating, even down to getting us complimentary toothbrush.The Continental breakfast was to die for! Its really a full breakfast which was great. Definitely would stay here again.There was no abnormal noise either, slept very well. We found this hotel to be clean and comfortable Great location and pleasant staff. We had a king room which was nice. If I had to find something wrong,it might be the lack of outside windows and the water pressure in the shower was low. But that was not a big deal. I think it is a nice hotel at a reasonable price. Would stay again. If you are looking for a clean place to stay this is NOT it. The restroom was more than dingy... floor, toilet, doors and loved the pubic hair in the tub. They clearly don't wipe anything down as there were pop can rings on the tables. Carpet needs to be cleaned/replaced. Did we mention we spent $200 on our room at the end of the season! We weren't told it was an adjoining room either. The website is so deceiving, the rooms look so modern and clean with a nice white duvet type blanket on the bed. Not in the room we were in!. Also woke up the next morning to bites or welts all over my face and neck. This is a very clean hotel with extremely friendly employees! They are very accommodating and genuinely care for their guests. 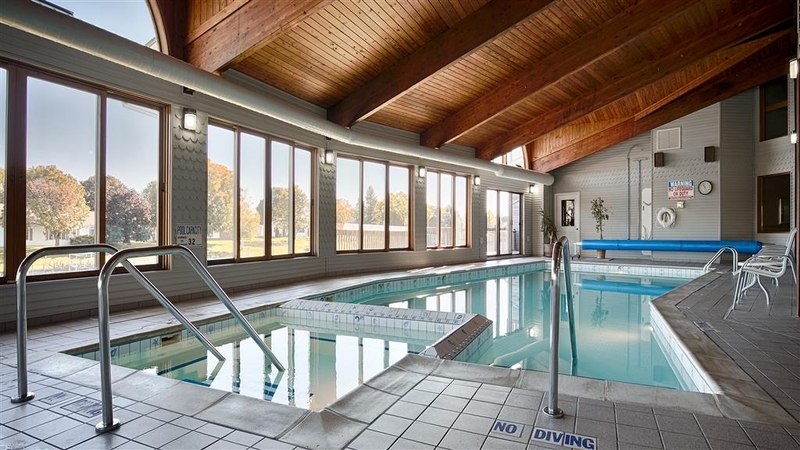 The indoor pool is nice and big and has an hot tub. The view of the River is nice from our room as well as the pool area and conference room. I would highly recommend this hotel! "Unfriendly staff and if you want breakfast go out to eat!" An older hotel however it was clean. If staying in the winter be prepared to walk into an igloo as the heat will not be in in your room. 2 out of the 3 staff members we encountered were very rude! Door deadbolt would not engage and breakfast was worse then most! We will not stay here again! We won't stay anywhere else in Cheboygan area except BW! Staff was very accommodating and helpful as we have a 5 month old new born traveling with us! Breakfast and breakfast area was pristine and warm as the weather was cold! Always excellent housekeeping and breakfast items, especially the steel-cut oatmeal.. On river, great view. Close to restaurants and Walmart. Really everything you need, including indoor pool and hot tub. I stay 5 times per year and wouldn't change - best hotel in Cheboygan. Ignore the dated exterior. The room was recently updated. It was clean and comfortable. 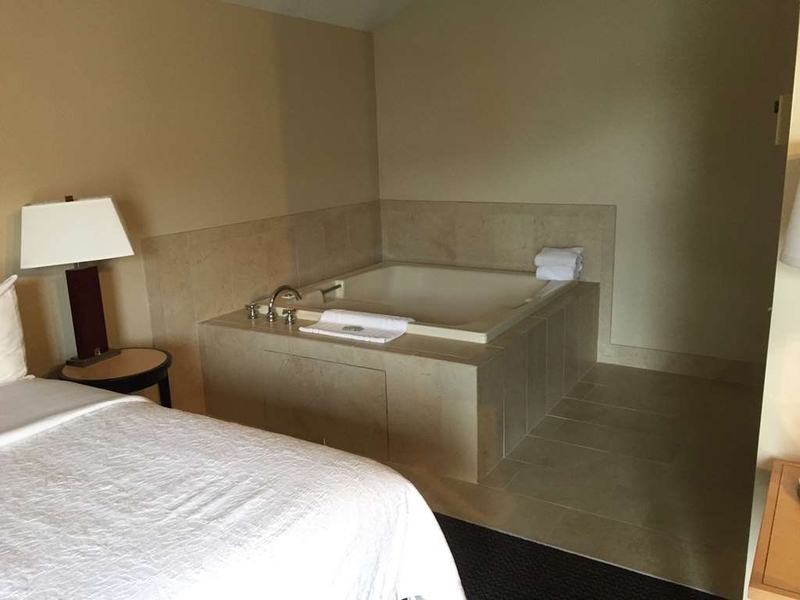 The Jacuzzi tub in room was huge and easily for 2 tall adults. The fitness room was acceptable. The continental breakfast was fresh and tasty. For the value, I absolutely recommend this hotel. The staff was very friendly as well. We spent one night here. The view of the river was awersome! The room was very nicely furnished - bed comfortable. Best expanded continental breakfast we've had. Staff bent over backwards to be friendly and accommodating. Too bad the street appeal is lacking because there is a treasure lurking there. Great value! The room was basic but totally clean and functional. My wife and I had a nice view of the Cheboygan River with a small balcony that we used multiple times. The staff was super friendly and helpful. The hotel was conveniently located near the attractions we wanted to see. The room was clean and comfortable. There were some things that could use updating but over all nice room. The private parking was nice so after the wedding reception there was a spot right next to the room. Friendly staff. Nice view from the balcony, we ate our take out dinner on the balcony watching the wildlife and boats go by. Continental breakfast was a little thin on choices. Coffee available in the lobby all day. This is a difficult one for me, as it was a combination of really good and really bad. The room price was good, especially for a room that walks right onto the river with a great view from the room. The room even had keyed entry into the back door, which is nice if you want to go spend some time back there. The room was perfectly fine, nothing special, and definitely older. Oddly, there was a chair that was half blocking the bathroom, which just seemed like some people would trip over going to the bathroom in the middle of the night. My first big complaint is the internet that didn't work more than half the time, which was explained to me as a city-wide outage. I could let that go, but when I said something to the front desk worker, she acted like I was putting her out by saying anything. The other one was the breakfast room. It was way too small, poor choices, and probably at least 80° (felt like 90°, but I would probably be exaggerating). Overall, it averages out to just being average, but fixing a couple small things would make this a nice place. All rooms at this hotel overlook a river. Absolutely beautiful. Each room has either a patio or a porch with 2 chairs and a table. I was so looking forward to sitting on my porch. The hotel is smoke free. HOWEVER one can smoke outside their room and we all know smoke rises. Which is what happened to us. Cigar smoke on top of it. That ruined my porch experience. I called the front desk and I am confident they asked the downstairs guests to stop smoking but they didn't. Aside from that our room was immaculate and well decorated. Bed was comfortable. Wi-fi connection not really great which frustrated hubby. There was a weird dripping noise in the bathroom but we couldn't tell where it was coming from. Sounded like it might have been coming from the ceiling light but no water leaked from the light. A little annoying. Breakfast was meager. We arrived 45 minutes after opening. I got the last piece of fruit and none was replenished while we were there. There was fresh oatmeal which was very nice. There was other food just not a lot of it. Almost seemed like it was being rationed. Or maybe the earlier people ate it all. All this being said we thought it was a very nice hotel and would stay again. I think we just got unlikely with the room we had. Unfortunately they were full so our room could not be changed. Maybe we'll have better luck next time. This room has a nice location as all the rooms face the river. The room was a good size, the showered a good water flow, the towels were large and plentiful and the bed comfortable. The room was very clean. Breakfast was a typical continental meal. The reason I gave a three was the room location. We were assigned two rooms on the bottom floor. The rooms were nice as they had a walk out to the river. The problem was that there is no elevator to the downstairs and although we all were healthy nearly 70 year olds, one had a back issue and this was not a good situation. There was no offer to help with the bags and the desk personnel were not the most helpful when giving directions. We will certainly stay here again. Our room was clean and comfortable. The breakfasts were convenient and tasty. We enjoyed the little patio outside our room. Activities and events we were interested in were easily accessible. "Nice Hotel on the River"
Really nice Best Western in downtown Cheboygan. Walking distance to downtown. Nice view of the river from my room. Staff was friendly, breakfast was good. Was a little pricey being Labor Day weekend. Otherwise, I'd stay here again. "River view rooms are nice, but pricey"
The BW River Terrace is a nice enough hotel for what it is. A basic, simple motel with modest accommodations and some rooms overlooking a river. But that view of the river comes with a hefty price tag for such modest accommodations. So be advised as to whether or not it's worth the price. Also, the site comes with some annoyances. Many of the prime parking spaces are reserved for boat trailers--whether they are needed or not. Consequently, parking can be a challenge if you want to park near your room entry. And speaking of room entry, if you are on the second floor rooms (as we were) you will need to drag your luggage up and down some stairs. Be prepared. Lastly, our room came with some quirks as well. The shower/toilet area in our room was extremely cramped, so be careful when closing the door lest you jam your toe (as I did). Moreover, the water pressure in the shower is relatively weak, and worst still the assembly connected the hot/cold piping backwards. At first, I thought there was no hot water in the shower, and only when I began to turn the faucet off did I notice hot water coming out. All that said, I wonder if the BW River Terrace is your best bet in Cheboygan. As we toured the area we found relatively few other options. Which, in turn, allows them to charge whatever they want. We arrived by pontoon and spent the night. Parked the boat outside the room and walked to the reception center. Our room was clean. The sheets/pillows were crisp.The coffee made in the single cup machine was good and was Hot and Now! I enjoyed watching the geese swim single file down river in front of our room around 7AM. Nice clean bathroom and shower with a big head and good water pressure. We liked this hotel. We had dinner at Big Boy which was next door. Came back and needed a place to play Mexican train. Randy opened up the conference room and let us play there. He could not have been any more accommodating than he was. Check out was cheerful and quick. We'd go back in a minute. Great check in. All the rooms have a wonderful view of the river. You are able to walk along the river just outside your room. Breakfast was very good. The room was very clean and very comfortable. If we ever travel this way again we would stay here. This hotel was great for the business trip I was on. Liked the location and everyone was very helpful.Will be back again next year. Very relaxing view of the river and very quiet stay while there.Enjoy. Nice hotel along the Cheboygan river. Friendly staff, clean rooms, comfy beds and a decent continental breakfast. 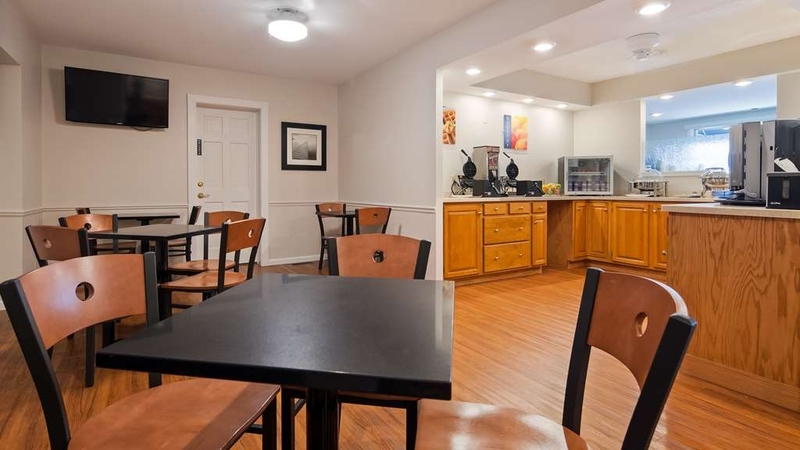 Within walking distance to restaurants. Like that you can dock your boat. Would stay there again. Staff were extremely helpful and courteous. Rooms were satisfactory how did have a mild mold smell. Room was clean however the sliding door coverings had a few black spots which I was hoping was not associated with the odor. Boat docking was extremely beneficial. Overall, this is a nice hotel situated along a river. It's relaxing to watch the boats go by. It's convenient to get to Mackinaw City and anywhere else in upper lower Michigan. The hotel is on a busy street, but you do not hear road noise during the night. Have fun! Very happy with my stay. Pulled up with my boat, stayed the night. rooms very clean, very nice view of river. All employees I dealt were with very professional and courteous. I would stay here again. This was part of my water trip on the Inland Waterway tour in Michigan. We stayed here on our recent trip to the Mackinaw area. Clean room and comfortable bed. Good Breakfast in the morning. Friendly and helpful staff.Nice view on the river.Overall an enjoyable stay. We will stay here again if in the area. Was not expecting a lot for an up north mid-range chain hotel. Was pleasantly surprised. Quick check in and request for ground floor room (yes, this is a 2 story walk up) was honored. Room was on Main Street with a fair amount of traffic, however, it was noise was never a problem. Hangers were tethered, however, there were enough. There were 2 luggage racks, 2 queen beds, a chair, a desk and chair and a nice size balcony on the river with view of the bridge. Beds were quite comfortable and we got a good nights sleep. The shower head was good quality and placed high, the bathtub was not very deep. The bathroom towels were quite fluffy and nice. Breakfast was nicer than anticipated for this price point to include hot oatmeal, biscuits and gravy, scrambled (powdered) eggs, cold cereals, a few breads and plain donut holes and, of course, waffles. There was plenty of seating including on the balcony in full sun. For winter time visitors there was a fireplace that was open in 2 rooms. Check out was quick and easy and we got a call shortly after leaving that an IPod had been left behind and found by housekeeping and turned into the front desk. We were close enough we turned around and went back for it. They did offer to otherwise send it in the mail. We turned in a small credit from a prior Best Western stay and were told it would be credited on our account. At the time of check out that had not been done. A call was placed to the front desk when we returned home, however, we have yet to hear back from "the manager". Not all rooms have a great view! Our room overlooked the pool on one side, and the parking lot on the other. Next time I would definitely make sure what I had access to, as we had no outside window to access fresh air. The only way we could get fresh air was to open our room door to the hallway. The pool was unusable for me — at a 10 which is usually the maximum allowed. Not everyone is sensitive to chlorine or bromine, so for others it is not an issue. For me, just not doable. Staff were very friendly, and breakfast was fine. "Friendly Atmosphere, Comfy Beds, Nice Breakfast"
Stayed for a family wedding in the area. This motel was very well-suited for our needs. The beds were super comfortable. Friendly desk staff who served us promptly and efficiently. We enjoyed the breakfast which was kept stocked and very clean; nice assortment of breakfast items. There is a dining room facing the river with several tables outside on the patio. Our rooms were on the second floor overlooking the river. The only thing that I would change is that I should have requested the ground floor level. It was a little uncomfortable for my mother to go up and down the steps numerous times. It was a chilly weekend so we did not take advantage of the proximity of the river. A very inviting setup though. I called the direct phone # here in Cheboygan when I originally searched for our place to stay and spoke with Tim. He was so friendly and helpful with answering my questions and getting us the best possible rates. Would definitely stay again! We stay here frequently and are happy with the rooms. Three out of 4 stays had very comfy beds. We did get a king bed that not comfortable. I suspect that one hadn't been upgraded yet. The rooms are quiet and all have a river view an balcony (2ND floor anyway). The pool and hot tub are nice, and the staff are friendly and helpful. "Great Spot in Northern Michigan"
From check-in to check-out, an excellent experience. Facilities are excellent and staff are pleasant, helpful and very familiar with the city. 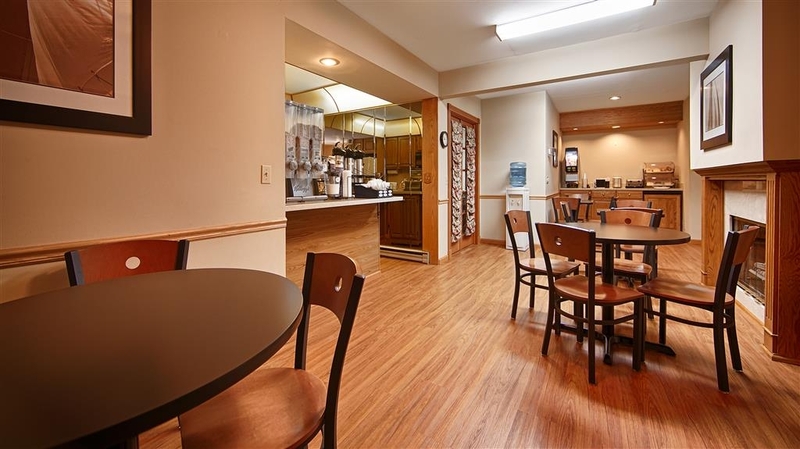 There are plenty of restaurants and other amenities in easy walking or driving distance. I stay here often on business and will certainly continue to do so. I recommend it highly. Thank you so much for the wonderful review. We are very happy that you enjoyed your stay and we look forward to seeing you in the future! 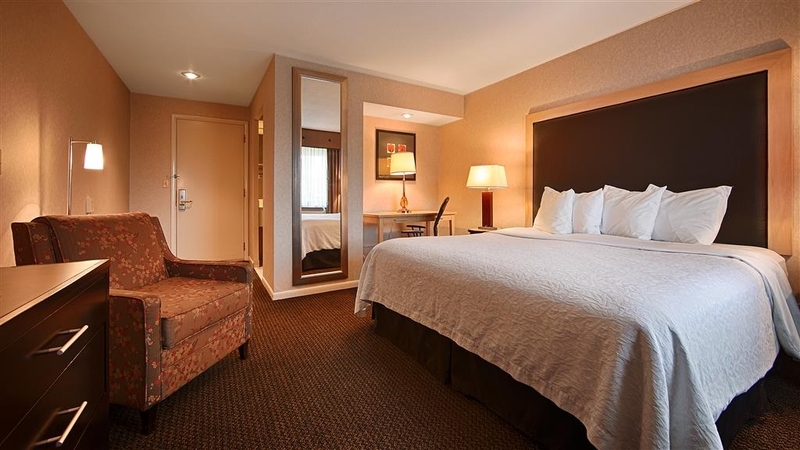 "Very nice room, great view of the river"
Always stay here for business trips to Cheboygan. Quiet, nice room, clean, nice view. The staff was friendly and helpful. The bed was very comfortable and I slept great, which I don't normally do the 1st night at a hotel. We are very happy that you enjoyed your stay at our establishment & look forward to providing you with our superior customer service & accommodations your next visit! "High School Bowling Regional weekend"
We just returned home from a successful high school bowling regionals. Our team has been using Best Western for several years however this was our first. Facility was clean, staff were polite, room was clean, bed was comfortable, breakfast was good, parking was easy. We did not visit pool due to our schedule. We didnt require anything additional from the hotel as travelers who checked in, had free breakfast and checked out, our experience was very good. I know we will return in February for 3 more years but if we are looking to stay in Cheboygan another time we would definately stay again and be able to enjoy the patio and river view. Thank you staff for making our stay simple. We are very happy that you enjoyed your stay at our establishment & look forward to seeing you in the future! My husband and I stayed here for one night. We had a king room facing the river. The view was great (a view of the water always makes me happy). The room was exceptionally clean and I loved the decor. There was a nice size mini-frig and small microwave. The public areas were very clean and fresh. 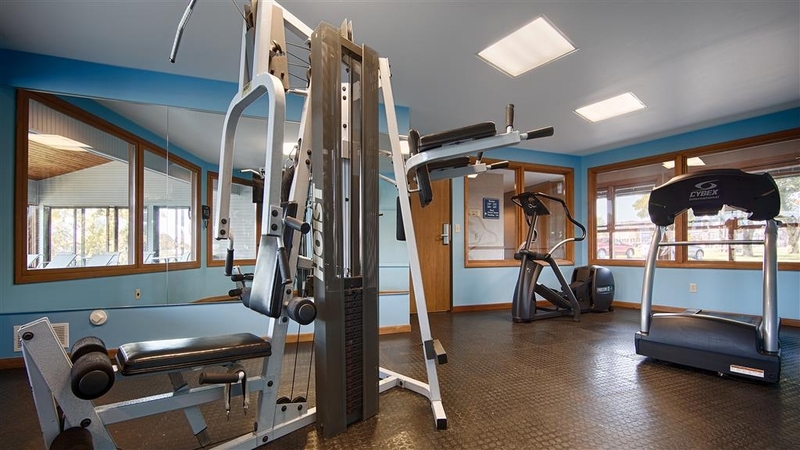 There is a nice little fitness room and indoor pool and hot tub. The continental breakfast was ok as continental breakfasts go. I believe that this is an older hotel, but you wouldn't know it once you stepped foot inside. I was very surprised with how well kept this hotel was. I would definitely recommend it and we will definitely go back! Kathleen - We are very happy to hear that you enjoyed your stay at our establishment & hope that you come see us when you are in the area. It was a pleasure having you stay with us! Besides being a great value, exception for breakfast and cleanliness always. I stay here ext 5 times per yr and never disappoints - very consistent, great staff. I highly recommend when in Cheboygan. Great location on water during summer months, close to restaurants and stores. We are very happy that you enjoyed your experience at our establishment & look forward to your next visit! "Fabulous stay at Cheboygan Best Western!!" The front desk lobby men were professional kind and very caring. 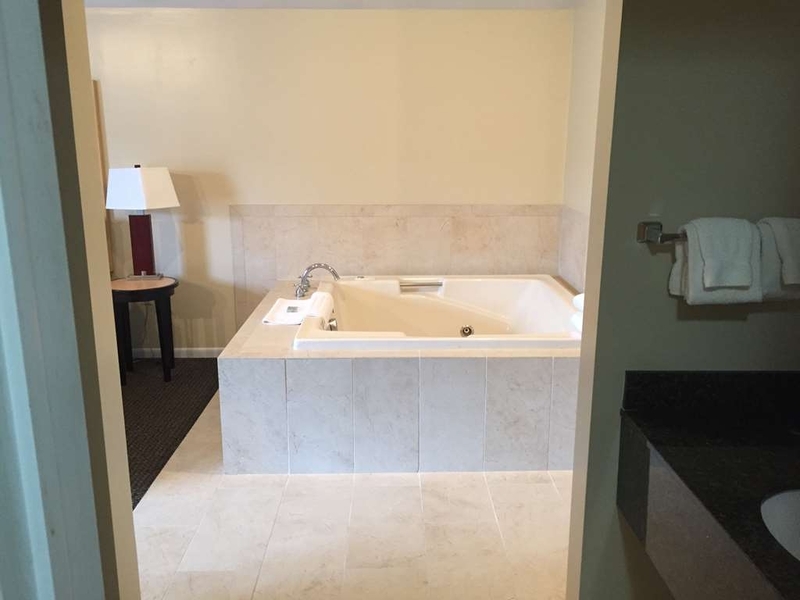 The next time I come up to Cheboygan I will for sure be staying at the hotel ,I absolutely want to try the honeymoon suite out just for how awesome it looked. Solid choice for the area. Have stayed in 4 different rooms over the last year. Some renovations more user friendly than others! Some bathrooms more awkward than others. Like other renovations we've seen lately some rooms seemed to have a bit more furniture than needed. We are very happy that you enjoyed your stay & hope to see you again if you visit the area! Great local choice with nice amenities. Close into town and easy access if you are headed to Mackinaw. Some good local places to eat like Pier 33 and newly opened Nauti Inn are a close drive. Dockage for boats is a HUGE plus too. We are very happy that you enjoyed your stay with us & hope to see you again when you are in the area! We stayed the night here while visiting friends. The hotel was nice. The room was clean and we were checked in early. The problem with our stay was other guests who were smoking outside on their balcony and all the smoke was being sucked into our room through the ventilation system. It was not a pleasant stay for those of us non smokers. It's a shame that smokers are so inconsiderate of other people! We are very sorry to hear about the people smoking near your room & that it came in through the ventilation system. If we had know we definitely would have contacted the people who were smoking to let them know they couldn't smoke where they were smoking. They need to be far away from the building to smoke. Again, sorry that you had an unpleasant experience due to smokers. If it ever happen again at any establishment you may be at, contact management immediately so the issue can be resolved. We are very happy that you enjoyed your stay & hope to see you again if you visit the area. Came up for a short vacation, friends recommended we stay here and they were right! The room was very clean, bed was actually comfortable! The complementary breakfast was perfect, gotta love those waffles! Staff was friendly and very accommodating. Indoor hot tub was perfect for warming up from the cold. Overall, shinning example of a Best Western! We are very happy that you enjoyed your stay at our establishment & hope to see you again when you visit the area! Clean rooms. Great staff. Nice breakfast. A bit dated although areas that have been updated have been done nicely. A bit overpriced for the "off" season. Right on the canal. Probably a nice place to sit and watch the boat traffic during the warmer months. This is an exceptional hotel. The staff is extremely friendly, breakfast was wonderful and the pool area/hot tub is immaculate. Definitely would recommend to anyone who is staying in the area. 15 Minutes from Mackinac City! We are very happy that you enjoyed your stay & hope to see you again when you visit the area! I have had the privilege of staying at this hotel each year for the past nine years.Nice comfortable rooms, great beds, always clean and fresh. The entire staff remains helpful and courteous. A special thanks to Tim at the front desk. He always goes above and beyond what is required. Nice hotel. Nothing really fancy but clean and in good shape. The views off the balcony in the back is great. Very peaceful feeling (October). Quiet area. No problems. Don't hesitate to stay at this hotel. Stayed in Cheboygan over the weekend. Checked in with a group (hockey team, five sets of parents) and asked if there was a community room to use - was told they didn't have one. The next day I noticed the "Meeting Room" sign and asked if we could use or rent it, was told it was being used all day and all night.Stopped down at the office a few times, the room was empty all day, and remarkably, all night. Must have rented it out to the invisible hockey team or other Marvel superhumans that I was unable to see. I stopped at the office to ask if one of the other teams had checked out, was told "Not that I know of, and regardless it's too late for a refund" in a very snippy tone...well, I wasn't really inquiring about a refund, thank you, but glad you could get the barb in. One of the parents asked for a rollaway and was told in a very "I don't really want to have to take care of this" attitude that there was a $10 fee, which he was happy to pay (unlike the counter gal, who was not happy to have to punch 30 seconds worth of keyboard in). Saturday afternoon several of us were enjoying a few drinks out back by the river, two of which had waterfront rooms on the lawn level...complete with two chairs each. We pulled the chairs over by the waterfront...and at 2 PM we were handed a garbage bag and told that people were going to start checking in shortly and those folks might need the chairs (again, the chairs were in front of our rooms to start with) and that we needed to make sure we picked up our empties (we pick up our empties without being asked typically). I'm not sure if they thought we were just a bunch of wayward alcoholics that were using their chairs for the afternoon or what. Overall, I'd never stay here again and unless you like being treated like you are a problem from the first minute you arrive pick another place. You can't even be honest with your critique of our hotel. NO ONE asked to RENT the Meeting Room. Our policies are our policies, regardless of if you care for them or not. We follow the policies which the owners put in place. You rented a room, not the whole hotel inside & out. Thank you! "ok for a few nights"
food is not the best and the hotel is in need of updating but it is clean for the most part. The staff tried to keep the place clean at least but it was not the first choice. If you are just coming to fish or hunt and don't care where you rest at night then this is the place for you. We stayed two nights and were very pleased. Beds were comfortable, room was quite large, it was quiet, wifi worked, and best of all was the balcony that overlooked the river - it was so pleasant to sit on the balcony and watch the river down below. We didn't use the indoor pool but it looked attractive. Breakfast was all the things you expect in an included breakfast (waffles, eggs, cereal, fruit, rolls, etc) but better than usual. Staff were very pleasant and helpful. Our room rate for two queen beds was $100, which I expect would've been higher in the summer. We are very happy that you enjoyed your stay with us & hope that the next time you are in the area you stay at our establishment again!! we really enjoyed our stay. loved the balcony over looking the river. wonderful room. very comfortable beds. excellent internet and television. will definitely stay again, and would recommend it to everybody i know. The employees here go out of their way to make you feel welcomed. The rooms are updated, very clean, and spacious, not to mention the view of the river from each room is a great way to help you relax. "Great place to stay! " We planned a last minute trip to Cheboygan and needed a pet friendly place to stay and this has been by far the best! Other pet rooms we have stayed in have been run down and noticeable that it was a pet room. The room we got not only had a beautiful view of the river but it was very clean and comfortable!! They also have very tasty coffee. From the minute I called to make my reservation with Will to the time we left we had exceptional service. Thank you for a great place to stay! We are very happy that you enjoyed your stay & hope to see you again the next time you are in the area! We were traveling from Ohio to the U.P. and didn't want to stay in Mackinac city. I was pleased with the reviews on trip advisor and they were spot on. We were very happy with the motel. We reserved a room overlooking the river. It looked like everything in the motel had been updated, and it was clean and comfortable. We had a nice balcony with two chairs and a table, and they were also clean. The room had good lighting and a reasonably nice chair for me to sit in to read. It had two luggage racks which we really appreciated. Nice water flow in the shower, and a quiet flushing toilet, comfy beds. Although there was no meat at breakfast, there were excellent scrambled eggs, warm biscuits and gravy, waffles, and other items. I would definitely stay there again if I were in the area. We stayed 2 nights with our 2 large dogs. The room was clean, comfortable, and quiet. We heard no noise from the road. Loved the patio and direct access to the lawn overlooking the river. Great breakfast and the staff was so pleasant and helpful! We are very happy that you enjoyed your stay with us & hope to see you next time you are in the area! "My brother and I visiting his 102 yr old Aunt"
My brother's cousin pointed out this Best Western and we're glad she did.I take my brother visiting various places since he can't drive anymore. He's 78 and I'm 81. We'll have to start staying at BW's from now on. This hotel is a regular stop on trips to/from the Upper Peninsula for me. It's a bit out of the way from Mackinac but it's worth it - the hotel faces the river and the rooms have river views. In previous stays I had a second floor room with a balcony over the river, but this time was given a ground floor room with a small patio. Both options are good, but I think I'd ask for a second floor room if you can. Wi-Fi is a bit slow and spotty sometimes, but otherwise good. The hotel breakfast is also a nice touch with warm biscuits and gravy and scrambled eggs to start your day right. The pool and hot tub also have river views and while the pool was a bit chilly this time around, they're a great place to relax after a long day of traveling. We are very happy that you enjoy your experience at our establishment & look forward to your next visit! "Really nice hotel with lovely view"
We stayed in a room with river front view and it was lovely; the beds were very comfortable and the AC was quiet and in good working order. Room was quiet with no road noise. Breakfast was standard but they did have eggs and good yogurt. the pool was also very nice. We would stay here whenever we go to Cheboygan in the future. We are very happy that you enjoyed your stay at our establishment & hope to see you if you visit the area in the future! Backside of room faces a river with peace and quiet, a very nice touch! Friendly clerk at check-in, making me feel welcome. (Surprisingly, some of the other hotels we visited made me feel that i was bothering them). The four of us occupied two rooms. Overall above-average. The bathrooms have knocking (banging) noise. We are very happy to hear you enjoyed your experience at our establishment & hope to see you again if you visit the area! I stay at this hotel whenever I can. Beautiful view of the Cheboygan river. Excellent service. Great breakfast with hot items too! The fitness center was nice along with the pool and hot tub. I recommend this hotel to anyone traveling up north in Michigan. We are very happy that you enjoyed your stay at our establishment & hope to see you if you visit the area again! "Great location, balcony overlooking the river"
We stayed two nights. Room was great.......coffee, balcony, refrigerator, etc. We booked a pet friendly room. All was great. There was a complimentary continental breakfast with hot items. It looked fine, but we ate at Alice's Restaurant (very good). We would definitely stay here again. We are very happy that you enjoyed your stay at our establishment & look forward to seeing you again when you are in the area! On an extended motorcycle trip, we did not know what to expect from this property when we arrived. What we experienced was a very friendly staff, a clean and nicely appointed room with a wonderful view of the river from our balcony. Breakfast was done well and there was plenty of room in the breakfast area, which is too often not the case. The location is convenient to the Mackinaw City area and there is a Walmart and laundromat close by should those needs arise. Nice place, friendly staff, reasonably priced. What's not to like about that? We are very happy that you enjoyed your stay at our establishment & hope to see you again when you are in the area! "Very pleasant surprise.....relaxing, comfortable and clean!" We booked online and this was one of the only hotels we could get in the area that would let us book for 2 nights over labor day weekend as other hotels in the area would not let us book unless it was for 3 nights. In the beginning we were a bit concerned that it was not a nice place to stay since it was one of the few left but turns out that was not the case. The room was very clean, spacious and the furniture and decor seems to be new and modern. We were able to keep the room cool with the AC while the bathroom had a separate temperature control inside. The sink was outside of the bathroom. The hotel was quiet and the bed was one of the most comfortable beds I have ever slept on in a hotel. The breakfast was awesome. They had typical breakfast items like cereal, yogurt, muffins, bagels, etc., but what we really enjoyed were the biscuits and gravy, hardboiled eggs, scrambled eggs and oatmeal. The oatmeal was already made and was not the little packets that was have to add water too. The coffee was really good also. This hotel is a short distance from Mackinaw City if you are planning on visiting. What I really love about this hotel was that it was on the river. There is a second door in the room that leads you out to a patio that you can sit on and you can walk right down to the river which is about 50 feet away. We really enjoyed sitting out there watching the ducks and boats going up and down the river. It was quite relaxing. This is a really nice place to stay. Clean, new interior, friendly staff, great breakfast, on the river, accepts pets. It's all of the things you want in a place to stay for a couple of nights. We enjoyed our stay and will be using this hotel from now on while in Cheboygan. We are very happy that you enjoyed your stay at our establishment & hope to see you again when you are in area! Really enjoyed this hotel for the view. It sits right on the Cheboygan River, has walkways down to the river, along with benches to sit and enjoy the river sites. The rooms have back doors that open up to the river. It was very peaceful and relaxing. We are very happy to hear that you enjoyed your stay at our establishment & hope you visit us again if you are in the area! "Overnight stay for Business Trip"
Very clean, friendly staff, beautiful view. Easy walk to nearby shops and restaurants. View of river relaxing with boats and wildlife. Would recommend to those staying for business or vacation. Short drive to Straits and lakes. We are very happy that you enjoyed your experience at our establishment & hope to see you next time you are in the area! Wonderful 2 nights spent at this hotel. Very very clean, the pool was nice (perhaps a bit too chlorine filled), breakfast was good, beds were new and comfortable. I loved our river view, having a refrigerator in the room, and the large size of the rooms. 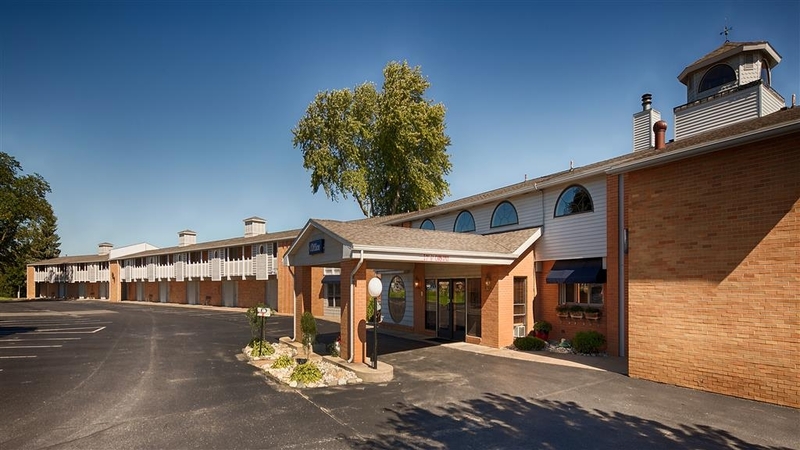 "Best Western River Terrace, Cheboygan MI"
Great location and beautiful setting. This motel is always very clean and tidy, staff very pleasant and helpful and a great breakfast every morning. No reason to look further when in beautiful Northern Michigan. Close to Downtown and on the river, with moorage and plenty of interesting sites. We are very happy that you enjoyed your stay & look forward to your next visit! Very nice Hotel right on the beautiful Cheboygan River. A view from each room. Always very clean and a delicious breakfast with the best sausage gravy you could hope to find with hot fresh biscuits. Staff are pleasant and eager to help. We are very happy that you enjoyed your experience with us & hope to see you again when you are in the area! We had a quick overnight stay here and were very pleased with the property. The rooms were a little above the moderate price but you get what you pay for....a very nice, modern room with a beautiful patio and view of the water. The place was quiet, super clean and had a very nice breakfast with an adjoining breakfast room with great views. Would stay here again. We are very happy that you enjoyed your stay with us and look forward to your next visit! "Relaxing Stay Between Family Visits"
We were looking for a place to stay away from a busy tourist spot. This hotel overlooking the river was ideal. We spent hours over two days sitting on the balcony watching the boats cruise up and down the river. The rooms could use some updating, but it was comfortable and clean. "Charming hotel on the riverbank"
Enjoyed our stay! The king room was clean and in good condition. The bed was quite comfortable. Great parking. Ability to dock boat so close was amazing. Enjoyed sitting on our patio to watch the boats. Would definitely stay again! We are very happy that you enjoyed your stay and look forward to seeing you next time you are in the area! A thoroughly enjoyable stay. Our balcony overlooked the river. We made reservations directly by phone. That, check-in and check-out were great experiences. The hotel location was terrific. This was our second visit and for sure, we will return. We are very happy that you enjoyed your experience with us and look forward to seeing you next time you are in the area! I wasn't expecting much as this was considered a 2 star hotel in the description. It was better than expected. 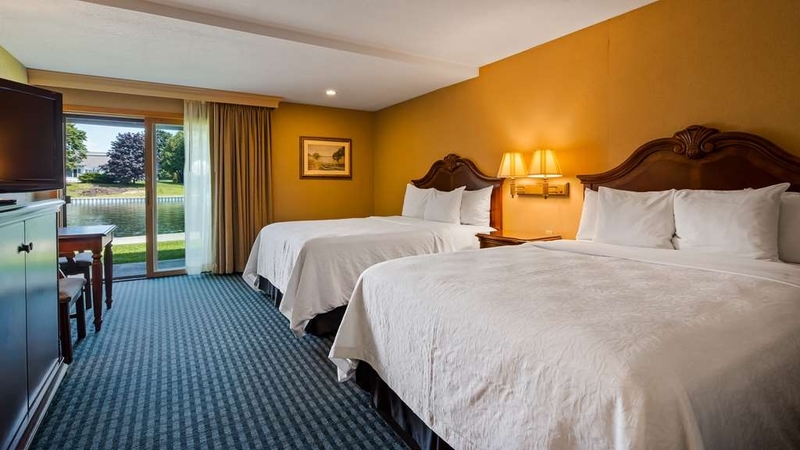 The room was clean and comfortable, there was a great view of the river and the staff was friendly. Went with my son and his family, got to spend some great quality time with my grand babies, loved the view from the room, everyone was friendly and helpful, great choices for breakfast, great area to stay in close to shops and restaurants. We are very happy that you enjoyed your stay and hope to see you if you are in the area again! "Indian River Boat Trip 2017"
Always a fabulous experience at Best Western River Terrace. Rooms are clean with amenities you would expect at this price point. Continental Breakfast is good and staff keeps it stocked and clean. Hard to imagine a more convenient location & setup for boating. We've been coming here for a number of years & have never been disappointed. We are very happy that you enjoyed your stay with us & hope to see you again if you return to the area! Excellent, well-maintained older motel along river channel. Great service by entire staff. Breakfast is well displayed, maintained by staff. 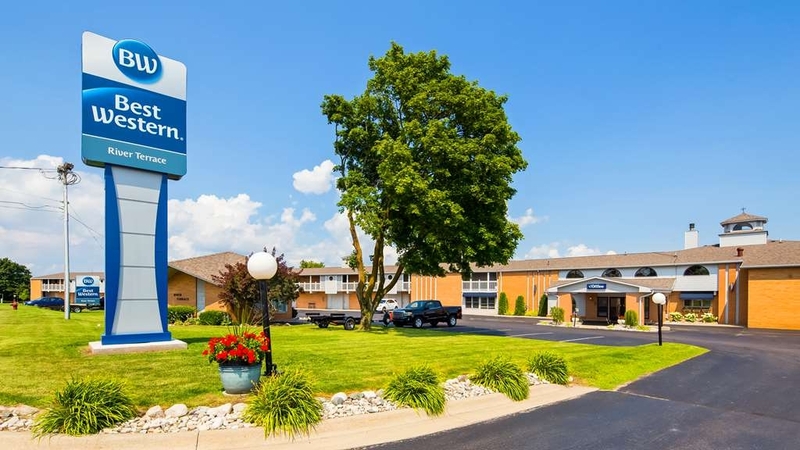 Best place to stay in Cheboygan, MI - I've stayed at this motel est 12 times in last 3 yrs, and I would definitely stay again due to consistently good management of the property. Thank you River Terrance. . I loved this hotel. 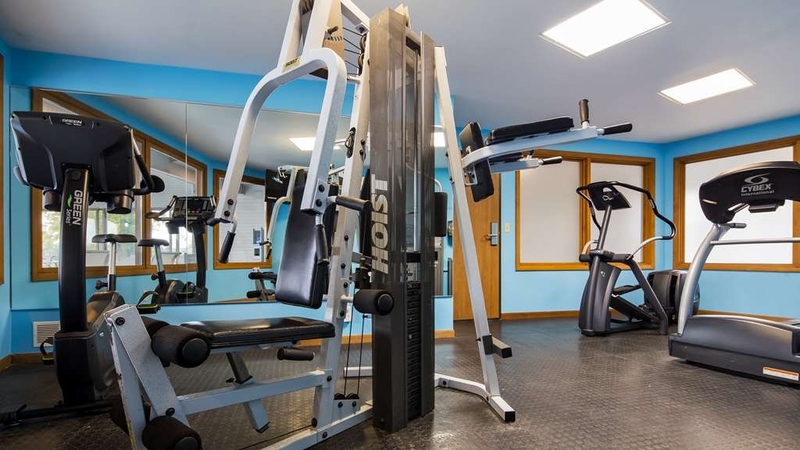 It was clean, updated, the staff was awesome and very accommodating, there is a special area dedicated to boats/boat trailers, it's in close proximity to a launch onto the Cheboygan river and we were able to tie off right outside our walkout room. Breakfast included, and we were only 25 minute drive up 23 to Mackinac city. The hotel is small and quaint - the room was very clean, there was minimal noise, the pool was very nice with a great view of the Cheboygan River. My family and I would stay here again in a heartbeat. Thank you for the kind review. We are very happy that you enjoyed your stay & hope that you visit us again if you are in the area! Overall a good place to stay. Still think the price was to high for location and town somewhat run down, but safe. Would stay again if we happen to be in the town. Could add more to the breakfast, but what they did have was good. "Nice hotel in Cheboygan, MI"
CLEAN! Nicely made up room. Good quality for the money. Nice towels. Bed was halfway decent(I have a bad back..) An in-room microwave would have been nice,but there was one to use off the lobby. The Boathouse and Mulligan's were 2 good, nearby restaurants. Pleasant trip. We are very happy that you enjoyed your stay with us! Thank you for the kind words. We look forward to your next visit. "Water front access & view"
If you are lucky enough to have a boat ...or, friends who do - you can dock at this Best Western! You have a terrific view of the water and other people boating from your room, too. Property does not have an elevator for upstairs access so book first floor is you have trouble with staircases. We are very happy to hear that you enjoyed your experience at our establishment & hope to see you again next time you are in the area! "One of the best places I have stayed"
I am fortunate enough to be able to visit the Best Western River Terrace in Cheboygan for a few days every summer for work. The property is very well maintained, the rooms are cozy and comfortable, there are excellent views of the river and so much to do around town after work. Each and every staff member has been positive, professional and fun. I have completely enjoyed every stay and look forward to next year. Call the front desk to make your reservation...much better rates and service vs. booking online. We are very happy to hear that you enjoy our establishment when you are in the area & look forward to seeing you next trip! Right on the river. Almost every room has a river view with patio or balcony. Very relaxing. We watched a multitude of boats and wildlife pass in front of our room. Pet friendly. Beautiful sunrises. Great breakfast. We are very happy that you enjoyed your experience at our establishment & hope to see you again if you are in the area! This is one of the better motels we have stayed in. The room was very clean and updated. We came by boat and when we went out for dinner then got stranded with a thunderstorm, the staff offered to pick us up and did everything to make our stay a pleasant one. Breakfast was very good also. We are very happy that you enjoyed your experience with us & hope to see you again if you are visiting the area. This is an older hotel that has been renovated. The exterior is faded and dated but the inside is nicely done, very clean and comfortable. The balcony overlooking the river is a very nice plus compared to newer hotels. Staff is friendly and helpful. We spent one night here during a trip to somewhere else in Michigan, and really enjoyed it. The rooms are a bit on the small side but the location - right on the Cheboygan River - is what makes this place great. The breakfast is good and the surrounding town is worth exploring. I wish we had more time to check it out. Thank you for the kind review, we are glad that you enjoyed your stay & hope to see you in the future. We are very happy that you enjoyed your stay and the Cheboygan area. We look forward to your next visit! All of the facilities and staff were very helpful in direction tothe funeral home. I needed to attend the visitation of my aunt who was to be buried the next day after her viewing on Thursday.Thanks to all of the staff who were very helpful during our Hotel stay in giving us directions to the funeral home and Church St. Mary's &St. Charles where the burial service was held. We are very happy that you enjoyed your stay with us and look forward to seeing you in the future! We were up north in Michigan for nine days and this was far the best hotel! The rooms face the parking lot and open onto the river. There is even a screen door and little patio with chairs! We were traveling with our dog and this was perfect. The rooms are relatively sound proof. The bed was comfortable. Everybody was friendly. The room was clean. It looks dated from the outside, but is very nice inside. Nice pool and whirlpool. Adequate free breakfast. The river view rooms with porches, boat docks, indoor pool, and picnic area set this hotel apart from others around. Also the friendly staff is always ready to assist with anything you need. After 11 years of spending part of each summer there I will keep going back! Thank you for the kind review! We look forward to your next visit! A clean, accommodating motel with rooms overlooking the local river. The pool area was well-kept and the continental breakfast had a nice variety of options. Nothing fancy, but I would recommend if you are ever in the Cheboygan area. Thank you so much for the kind review. We are very happy that you enjoyed your stay and hope to see you in the future! Sitting on our little patio with a river view was the most wonderful part of our stay. We watched the boats go up and down the river for hours. The room was great. The bed was very comfortable. The breakfast was great and the employees were great! I highly recommend the Best Western In Cheboygan for some great and relaxing fun. I must say this was one of the best hotel stays I ever had. Tim an Andrew at the front desk went out of their way to help me get a room when I needed to spend another night an the hotel was booked full. The rooms where clean an comfortable as always. An the breakfast is always good. THank you all for making my stay most enjoyable. I would stay here again, the outside space was great, the room was nice and close to down town where we had a good dinner. they just need to keep there guests in mind until it is time for them to check out. no lawn mowing or house keeping knocking on the doors before check out time. We are happy that you enjoyed your stay & look forward to your next visit. I wasn't overly impressed, but the room was clean, had a free continental breakfast and great views of the river from my second floor room. There was also ample parking and the staff and management were very nice. We are very happy that you enjoyed your stay with us. Thank you for the kind words & we look forward to seeing you in the future! Very nice clean friendly hotel. I was able to take my pet and felt very welcomed. It was so nice to come back to the room after a long day and sit by the river. The room had free internet, everyone said hi as you passed them and was willing to help with anything. I will go back again. We stay here whenever we are in area. Love the friendly and helpful staff. Rooms are nice and pool is great. Highly recommend to all types of travelers in all seasons of year .Good location right in town and close to restaurants. We have never been to Cheboygan and wanted to stay at Best Western for rewards. This hotel from the front is not really appealing but all the rooms faces the river on opposite side and is very nice with beautiful landscaping. We had upper floor (no elevators) with balcony. The room was small overall. The breakfast was good. They provided biscuits and gravy, hot oatmeal and scrambled eggs but no meat. The breakfast area is small but you can sit in other room with the river view. We are glad that you enjoyed your stay with us & hope to see you in the future! "Best kept hotel in upper Michigan"
Was totally impressed with this hotel.I usually stay at 4 star or better but this hotel was pet friendly and very very clean for an older hotel.Nicely updated.Totally surpassed my expectations.pool and hot tub were clean and very well kept.I could tell this establishment cares about there guest.I very seldom write a review but this place deserves to be recognized. We are glad that you enjoyed your stay at our establishment and look forward to seeing you in the future! Thank you! Friendly staff, great breakfast, conveniently located next to river for boat docking, comfy beds. Love this place! Have stayed here every Memorial Day weekend for 3 years, friends have stayed for 5 years. Tim is great and housekeeping does a phenomenal job. Already looking forward to next year! We come every year with family and enjoy are stay each time. Staff is always friendly. I loved being able to view the river and walk right out to the river. I think I found a new favorite room. Hot tub however always has floaties. Thank you for your review of our property. We hope to see you in the future! The motel was in a good location for us. We were going to a destination wedding. The wall paper looks like it's dirty or moldy, but that's just the design. When they redid the interior of the room they put the old moldings back up. Looks terrible. The front door latch, the safety latch, was mounted with two little screws. Breakfast was good. That was comfortable. Otherwise enjoy this stay. "A Clean and Friendly Place"
Service and breakfast spread really great -- friendly, clean, second floor room had scenic view of river and outdoor veranda. Temperature and comfort level of beds was all good, no funky smells or weird stains as is often the case -- everything seemed well maintained. Thank you for the wonderful review of our establishment! We are very happy that you enjoyed your stay and look forward to seeing you in the future! "Get rid of office help." The room was nice, I will give it that, but that's as far as I'd go. DIL booked rooms, and didn't think about accessibility. I called 5 hrs. earlier to ask what floor we were on and told 2nd floor. Explained that we are physically handicapped, and our children have 2 babies & all that goes with. Even when we asked, we were told that all rooms on the 1st floor were already booked,and basically - "too bad" that hubby cannot walk w/o assistance, and I .have had 16 knee surgeries, and right now fighting with a fractured kneecap. Yeah, stairs are not our friends. Pool hours are from 9:30a - 10:30p. How can people enjoy a nice swim in the AM when they are busy checking out ? Same with at night when adults want to swim after coming in from a night out, or get the kids to bed. Also, as we traveled over 700 miles to visit our grandkids and children, we had our local family & kids come over to visit and use the pool. The next afternoon, we had to find out from an outside family member that non-guests are not allowed in the pool room or the pool - EVEN THOUGH IT'S NOT STATED ANYWHERE. Also, we were told that the pool room was trashed. I'm sorry, but I'm a 63 y/o woman who does NOT leave messes. In fact, I personally walked the entire pool room and picked up every anything that was laying around. That room was spotless. Because of this, we were threatened to be evicted if we kept it up. Breakfast is only served until 9:30a. Too early in my opinion, especially when one can go to any other hotel chain and breakfast is served until at least 10:30a. After breakfast, the area is roped off. At one point, the female working the front desk treated me as if I was going to take down the rope and barge through to the dining area, simply because I stood AT the rope and the just looking - not even touching anything. The lady who worked the front desk all weekend - Melissa; yeah, she either needs an attitude adjustment or find employment where she doesn't need to interact with people. Her attitude was "my way is final", and would not hesitate to argue. We were overcharged on our room at final checkout, and even though I had it in black / white, she wasn't going to budge on adjusting until another lady came out. Even she was a little strong but finally decided " just this one time" to credit the account. I also went to Melissa at one point and explained that we were staying in town one extra night, but could not afford to stay at this motel ($100+ for 1 bed) and could she price match another hotel in town. When Melissa replied, I was actually stunned at her attitude. I actually felt dirty / scorched. Her attitude was "how dare I" ask such a thing. Well, my theory is that less is better than nothing. If I can fill a room and make "some" money, that is better than NO money. Oh well, Guess my thoughts are wrong. Will my husband and I stay there again ? NO. While offering a nice room is good, that is only part of a good stay. I want to stay somewhere where we are treated with courtesy and accommodate their guests, not themselves. We are sorry that you did not enjoy your stay. As for the pool & whirlpool, there is a sign posted right on the front door of the pool that NO VISITORS are allowed in the pool area and when you signed your registration it also states the same thing right on the registration card. We do not have a "public" pool, it is only for guests. How are other guests supposed to enjoy the pool when other guests invite 20 people to use it. This is exactly why we have the rules we do, and why they are stated in black & white on the pool door and registration card. When we have multiple guests coming to complain about all the people in the pool & their behavior, we are not going to let this be just to make someone who doesn't obey the stated rules happy. "Desk clerk was like staying at Bates Motel"
The toilet in our bathroom was loose and moved noticeably when we sat on it. We told the front desk clerk who didn't care. Even though there were only a half dozen cars in the parking lot, we weren't offered another room nor did they send anyone up to fix it. We put up with it for our two day stay. At breakfast, the desk clerk followed us into the meal room and sat down and just stared at us the entire time we were there. It was totally creepy. We were the only people eating breakfast and its not like there was anything of value to watch over--the utensils were plastic and the plates were paper. We don't know what that was about but it was so bizarre and creepy we'll never be back. Wonderful place. We had to check in late due to travel and all went well. Very friendly and accommodating for a late check out as well. Even being a holiday, everyone was friendly and the place was clean. Pet friendly too! "Relaxing stay close to town"
Clean friendly hotel. Nice amenities including BBQ pits etc., for having your own cookout if you wish. Dock out the back to pull up your boat. Very close to bicycle trail which takes you to Mackinac City about 20 miles northwest. Very close to town so can walk in for dinner. Staff very helpful. Each room has beautiful river views. Breakfast choices are more than ample and presented in an appealing way. Staff is friendly, helpful and efficient. Beds are very comfy and fridge and coffee maker in each room. We are very happy to hear of your positive experiences at our establishment and look forward to your future stays! "A stay with the Hockey Team"
Very nice hotel on the water. We plan to come back with our boat and keep it in the river next to the hotel. Most all rooms have a view of the river. 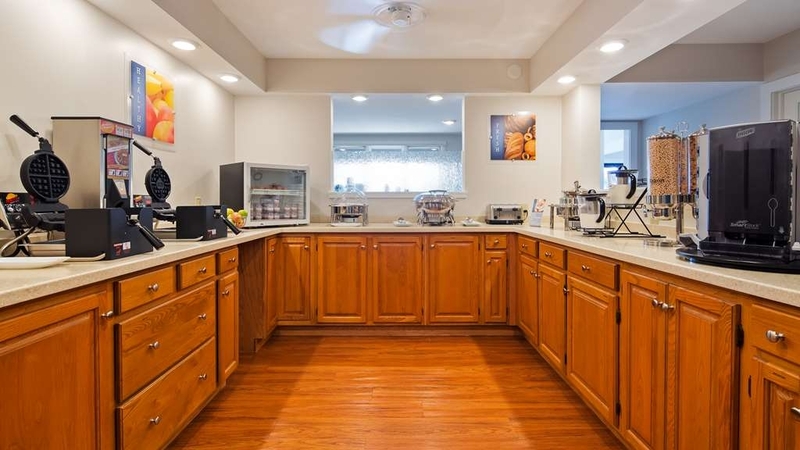 The breakfast area is nice and there are plenty of other options for dining out. Thank you for the review of our establishment. We look forward to seeing you in the future! "second night michigan tour 2016"
We are glad that you enjoyed your experience at our establishment! We look forward to seeing you again. Thank you, Tim. I rally enjoy this property to stay at when I am on the road traveling for work. great location. a lot of food choices all around you. shopping nearby, next to the waterfront. very nice pool area for your use, and a great breakfast choices. We are very happy that you enjoyed your stay at our establishment! We look forward to seeing you in the future! Loved the balconies overlooking the river, the pool and hot tub temperature, the music in the pool room, the fitness room, the room itself and the staff. The breakfast was good too and there was plenty of room for everyone to sit. I would definitely stay here again. Thank you for the kind words regarding our establishment. We look forward to your next visit! Front Desk staff went Above and Beyond to allow me to extend my stay. Thanks Andrew. The rooms are a bit dated and fortunately there are signs directing people traffic to breakfast. You could get lost exploring upstairs. Outstanding service with easy check in. Beautiful setting and close to downtown area. Super friendly staff. Awesome breakfast area with many choices. Breakfast is complimentary with stay. Highly recommend to others. Staying at this hotel was a wonderful experience. It is located in a beautiful setting along the Cheboygan River. It is centrally located to shopping, restaurants and points of interest. The service was top notch from the time I made the reservation by phone until the time of check-out. The room was beautiful and the beds were comfortable. I will make every effort to stay at this hotel the next time I stay in the Cheboygan area. 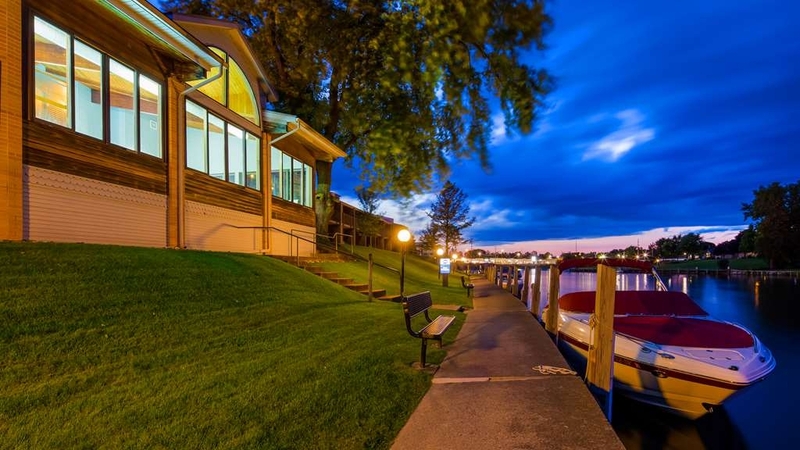 This hotel, love acted right on the Cheboygan River, is a beautiful spot for any season. The rooms face the river with balconies, and porches. This is a clean and nice place to stay at a very fair price. I wish the breakfast had more choices and served local baked goods. Thank you for your nice review of our establishment. We look forward to seeing you in the future! Great place nice view great rooms. fair price sweet pool hottub right on the river with place to tie up next to food. very nice. Best hotel in town will be back I like the room number 144 with a hottub. My sister and I were up North for a long weekend and stayed at the BW River Terrace. It's location is right on the river and there is a nice view. The rooms were smallish and everything was very clean and neat. The "outside" door doesn't block all the road traffic but unless you're a super light sleeper (and I'm a light sleeper myself) it shouldn't be too noticeable. The Continental breakfast is from 6:30-9:30 am and when it gets closer to 9 am, the availability of food choices goes down. I take of 0.5 off the rating for that, so my true rating is 4.5 out of 5. I would most certainly stay here again if in the area. 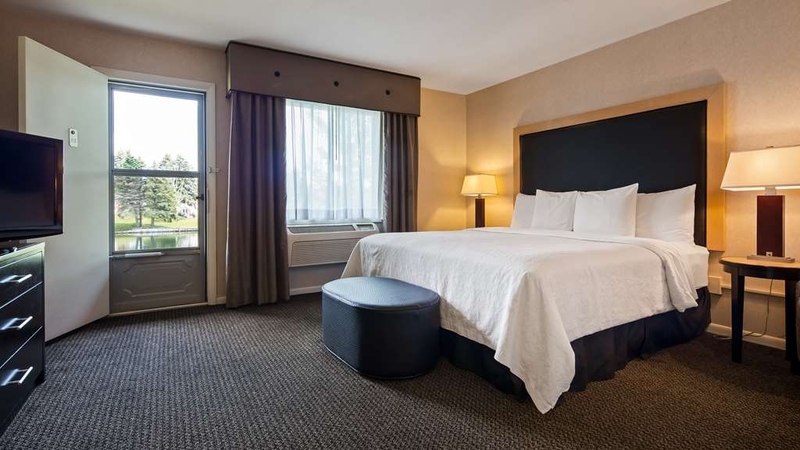 "Quality stay in northern Michigan"
This was our first time staying at this hotel and we were pleasantly surprised at how nice this hotel was and was reasonably priced, We love the fact that it is pet friendly and ok with the minimal charge for pets. Every room has a view of the river and the pool area looks inviting even though we did not use it. Staff were helpful and check in/out was easy. We will defiantly be back here!!! We would recommend this hotel, very clean, pleasant and helpful staff. The view is beautiful along the river. Nice location, a restaurant close by and other shops withing walking distance. The pool and hot tub were an added bonus for our stay. "Five Days in A Great Facility"
First let me rave about Tim at the front desk. There isn't a nicer more friendly and helpful individual in the hotel business. He is so nice he took my pasta that I was heating in the microwave in styrafoam (which is a no no I found out) and put it on 3 paper plates and heated it up for me! He gave me a fork and knife. It was pretty good. He looked up places where I could purchase US 23 Heritage gear and I called the Ausable Trading Post in Oscoda and they have it! He gave us a fabulous room on the 2nd floor overlooking the river and at the end of the building. Always smiling and just like a welcoming beacon always there. This is a great place to stay. I have NO complaints and that is unusual. I would stay here again. We stayed for 5 days and used it s a jump off point for all the wonderful things to see and do from Mackinaw to Cross Village Harbor Springs and Charlevoix. Got into Cheboygan just after 6 pm. Got the first room off the lobby, you can see the river over the indoor pool an hot tub right outside the rooms back door. Nice and clean with a queen bed. A Big Boy restaurant is right next door, that spells dinner! Have not eaten a a Big Boy in 15 years & they were good back then. One of the highest Trip Advisor hotel in town. And the price said sleep HERE! Very nice after 9 hour's on the road today. Looking forward to that big queen bed after dinner and a soak in the hot tub. This Best Western is right on a river with a great view. Wish I would have taken my fishing rod. Check in was a breeze even with a newbie being trained. The hot tub and pool were great. Didn't take the time to use the fitness room but it has one. Will be going back to this one. We enjoyed the river view room even though it was an overcast and cool day. The hotel was very clean and the staff friendly. The bathroom was very small, but the shower was nice. The breakfast area is small, although they do have an overflow room. Selection of items was very limited, no hot eggs or meats. We likely would return if we were in the area. We spent three nights as our home base to visit the Soo, the tunnel of trees, Petoskey and Charlevoix. (Avoiding Mackinaw City was a priority!) Room was clean and comfortable, overlooking the river. No elevator to the second floor, but Tim at the front desk graciously assisted with luggage. A very pleasant stay! "Very clean and neat place to stay"
"Great place on a budget"
Was pleasantly surprised by this hotel. Rooms were very clean, staff was friendly and helpful and the breakfast was nice and had a nice variety of choices. All the rooms face the river and it was nice to sit outside and relax and enjoy the views in the evening with a glass of wine and in the morning with a cup of coffee :-) The hotel is only about 15 minutes away from Mackinaw City and the Ferry's to the island. This hotel is right on the water and every room has a terrace overlooking the river. Wonderful! I stayed for business, but had a great time exploring Cheboygan and we even got to rent paddleboards that we used right outside our hotel room. Would definitely stay again. Rooms were clean. Breakfast was basic, but good. I travel for work and get the pleasure of my company putting me up in this hotel often. The rooms are always clean and the front desk staff are always super friendly. Every room has a view of the river and you can watch the ducks, geese and boats go by. Last winter my sisters & nephews came to visit for the afternoon and the manager allowed them to swim in the pool and enjoy the hot tub (he said he normally wouldn't do that but the hotel was not busy). 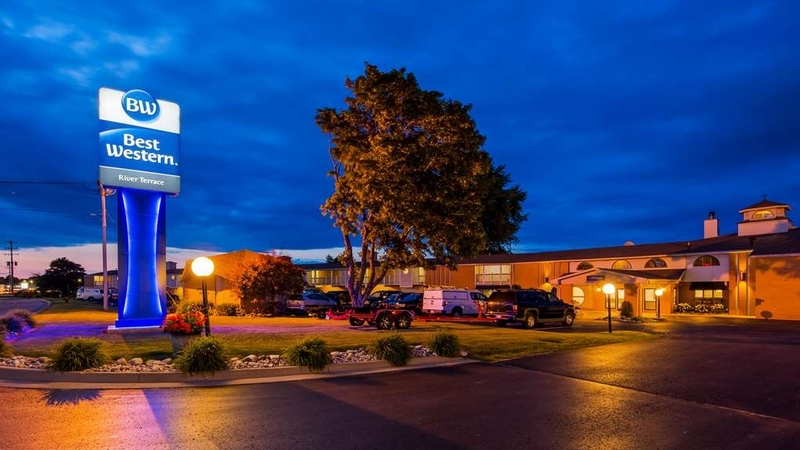 "Perfect Stay in Cheboygan Best Western!" 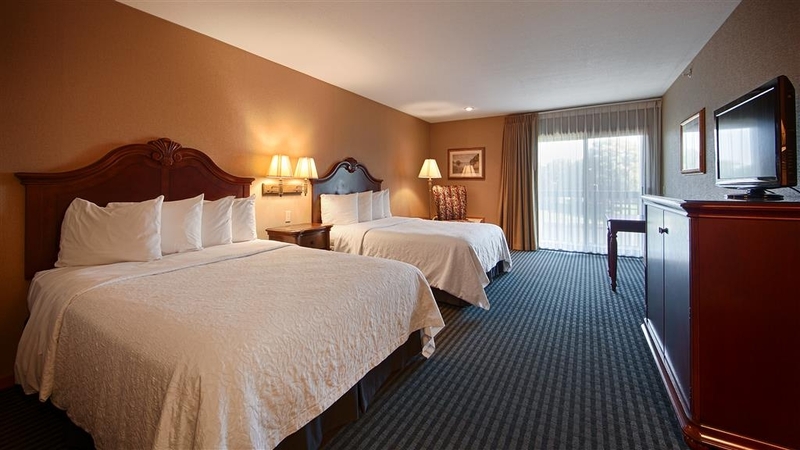 We chose this Best Western because we wanted to visit Mackinaw City and St. Ignace areas. This Best Western was Just a 15-20 minute drive to both cities, and during our stay we also drove around Cheboygan to shop a bit, and had breakfast at a WONDERFUL little place called Alice's Restaurant! Very good meals! The hotel was very clean and we had an enjoyable stay. "Skip Mackinaw City and Stay here for much less"
We stayed at the River Terrace for 3 nights. We had a ground level room with screen door that opened to the river. This is a very clean and well run motel. Our porch along the river was a nice place to sit and enjoy a cocktail after a day trip to Mackinac Island and City. Staff were more than happy to make suggestions for dinner and all the suggestions were excellent. Breakfast was nothing fancy, but enough to get you going in the morning. I would stay at this location before any overpriced Mackinaw City motels. Get away from the crowds and stay here. "Enjoyable Stay over Labor Day"
Loved the King Deluxe with a river view because of the microwave and the balcony. If I had to complain it would be that the pillows weren't very comfortable, but that is just my personal preference. Otherwise, I love this hotel and stay here every time I am in the Cheboygan/Mackinaw area. Stayed for 2 nights in August before going to Mackinac Island. Found it to be very clean and a pleasant place to stay. Parking lot side and river side of the rooms are like night and day. Very nice river view from almost all rooms. Continental breakfast was good with plenty of room. Front desk person (Tim) was very pleasant and helpful and even managed a minor "smoking area" spat with great skill and tact. Rooms on lower level have a patio area, upper level ones have a balcony. This place is a reasonably priced and attractive alternative to Mackinaw City on the "big water". Would definitely stay there again when in area. Perfect location for our Inland boat trip! Check in was easy and fast. Room was super clean and the grounds were very well kept. Loved that we were able to to use the dock to keep our boat out front. Pool was a great added feature. "River Terrace Hotel, Cheboygan, MI"
We have stayed at this hotel numerous times, and always found it and the staff extremely helpful. This time we couldn't get a first floor room, as we have in the past, and it caused us some difficulty, due to my wife's challenges in climbing stairs, made worse by a fall earlier in the day. There is no elevator. You won't find a cleaner and nicer place to stay. The staff are exceptional. It is so nice to have a continental breakfast to start your day. Everything was warm and fresh. The hot tub and pool are very clean and nice and warm. If you have a boat and are planning a boating vacation or weekend request the river front rooms with room access to the river and your boat. We have stayed there 4 summers in a row and have never been disappointed. The Best Western on the River Front in Cheboygan is a great place to stay on the Michigan Inland Waterway ~ Easy access around the corner to take the Lock out to Lake Huron, Mackinaw City and Mackinac Island .. One of the few places you can arrive by boat and can walk to fast food and stores. Definately a Great Place to Stay!! From the front I wasn't really sure about the hotel, but once inside it was very nice. We loved that we could walk to the river from our slider. The pool is very nice and I had a great experience with the staff. This is the second time that we have stayed at this hotel. It is a nice hotel with a great view of the Cheboygan river. We wanted a room with microwave, so we booked a king bed room with fridge and microwave (this is the only room that apparently has a microwave). We discovered later that we could have picked a different type of room and used the community microwave by the office. When we walked in, the room had a funky smell to it (when we stayed last time, we didn't notice any smell in the room). We thought about inquiring about moving to a different room, but we had already unloaded all of our belonging and were tired from a long drive and day behind us. So, we just ran the air conditioner all that evening and night and that seemed to help the smell somewhat. Also, this type of room and a door with a half screen, so they wasn't much air coming in. The last time we stayed, we had a 2 queen bed (with only fridge), but that room had a doorwall leading out to the balcony, which was much nicer. If we stay there again, we would make sure we got a room with doorwall (much more air coming in and easier to go out to the balcony). The pool (saltwater) was one of the warmest pools we have ever used at a lodging, it was wonderful. My wife usually takes a while to get in since most pools are cool or she doesn't go in at all. This pool, she went right in with no hesitation. The breakfast was pretty good, but the area was very tight and congested. I would recommend this hotel if staying in Cheboygan, as it is the best one in the area. I would suggest possibly checking out the room before committing to it. Room was nice, view was beautiful, pool was great for the kids and breakfast was decent enough. Thought it was odd when we checked in that the slider to the deck was open instead of the AC on, but the weather was nice. Evening rolls around and we decided to close up as soon as the second hand smoke started to drift in. AC unit wouldn't stay on for more than 2 min. Response from the desk was "a lot of people are having that problem" and we were instructed to just turn the fan on high. That worked well enough, but highly disappointing for the price, during peak season. Second year in a row ask for a specific room and are given the worst room in the house--not a busy time. Don't waste your time trying to talk to this group! Thought last year was a fluke--must be standard! Appears to be a good place to stop with your boat while on the inland waterway in Michigan-- there are few places you can stop with your boat--we will look for other places or just not visit area again! I'm a bit of a princess when it comes to hotels. My husband booked this hotel and I was a bit nervous. I was wrong. Very clean, quiet and great view. Tim on the front desk took the time to call my husband to let him know a king room was now available if he still wanted one. Nice clean place. My husband and I stayed at the hotel on our last night of our northern Michigan trip. The desk clerk was polite and helpful. The room was clean and well stocked with a fridge, and microwave. The bed was comfortable too. My favorite part was the view from the room balcony. The second floor rooms each have their own balcony with a table and chairs. The lower level rooms have small patios that also look out on the river. We stayed three nights here because the reviews on the hotels in Mackinaw City were so average and this was $50 less and looked nicer. We were glad we stayed. Because of the design, you didn't hear highway noise and overlooked the beautiful river. The room was small but so homey, nicely decorated and a back door to the balcony. The breakfast was continental but quite adequate. Ate at Big Boy one morning next door and that was very good. Management was accommodating and really seemed to care. "Clean room, friendly staff, yummy breakfast, and 30 minutes to Mackinaw City"
When we pulled up, we weren't sure as it look liked an average motel. We, however, were quite surprised! Our room was located on the first floor (technically the ground floor/basement -- it's a funky layout) and it was wonderful. We had sliding doors onto a small patio that overlooked the river. In addition, the bathroom was super clean and the housekeeping staff did a great job. The beds were super comfy and there were tons of TV channels. I needed to print out some things for an online class I am taking, and the computer+printer in the lobby worked well and I was able to print my documents without a hassle. The staff were super welcoming and friendly and the breakfast was good. The only hot breakfast food they had was waffles, but there was a variety of tasty options. The hotel is also located within walking distance to various restaurants. I would highly recommend staying at this Best Western! "Excellent -- except for sofa bed"
Was on a biking trip with my 4 sisters. We had two rooms. One with a sofa bed and two beds to accommodate 3 of us. The beds, bedding, cleanliness and decor were very nice. However, the sofa bed was so bad that I took the sofa cushions, placed them under the bottom sheet of the sofa mattress and used them to sleep on. The end result was very good. The wife & I have stayed here numerous times ...we keep returning because this place is very homey to us . So this time the wife took our TEXAS friends (gramma and her 2 grand-daughters ) THEY too had a very great experience .Although this is an older Best Western , the place is clean , rooms are roomy ,the staff is awesome and the river is comforting . The housekeeping staff is friendly and do an awesome job of tidying the room when we doing day trips . Nice location on the river, and reasonable walking distance (~1Mile) to shopping, restaurants, etc. Breakfast could have have had a better selection. Smoking outpost location was right outside of our room. We booked a trip to northern Michigan last minute, we were able to secure the last room on the Fourth of July weekend. The hotel is on the Cheboygan River and provides docking for boats of the people staying in the hotel!!! This alone will make me return. The docking allows easy access to Lake Huron and Mullet Lake. 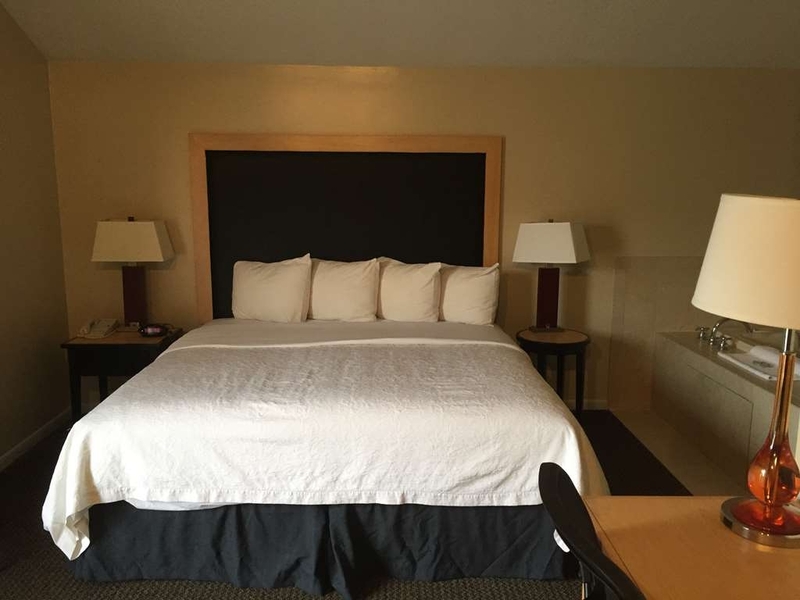 The room was clean and comfortable and the staff polite. We used the hotel as base for traveling to and from Mackinaw City and Mackinac Island. The pool was clean and not busy. The ONLY downside was we could hear everything the guests in the room above us did! I have never been disappointed staying at this hotel. Beautiful location on the river front and very helpful and courteous staff. The only minor ping I would give is the dim lighting bulbs in the room lamps, I know it saves energy but sometimes I need a bit more light to comfortably read. Perfectly OK. The rooms were big and clean, though one of the rooms was a little stuffed. The breakfast was as expected, and the staff was welcoming and helpful. The location is nice, but there's not that much to see in the city. Stayed here before going further up north, and city-wise I'd rather recommend Mackinac City. "Great Value, Service and Property"
Very nice, clean rooms. Exceptional value for the price. Beautiful view of the river from my room. I recommend for anyone visiting the Cheboygan area whether business or leisure. It is conveniently located next door to a Big Boy so that made grabbing a quick meal easy and convenient. "Great pet friendly place to stay." This is a great pet friendly place to stay on the river in Cheboygan, MI.Right on the river with docking available for boats. We really appreciate being able to stay somewhere as nice as this with our dog. The room was very clean and well maintained. "Beautiful views, nicely appointed rooms." Our 2 night stay at the River Terrace was very nice. Our ground floor room had a private, walk-out patio with table and chairs, overlooking the Cheboygan River. Just steps away from a riverside walkway and boating docks. It was quieter than expected for the Memorial Day Weekend, and the rates were very reasonable. Close to restaurants and stores, minutes from the beach and downtown. this property is a really great place to stay at. I have had the pleasure now of staying at this property several times and I always get the best service. I also see and hear it , for the other guest, that are in the lobby.always clean rooms. "Nice hotel - Great location"
Great place to stay with a beautiful view of the Cheboygan River, ducks, geese, and loons. Very good value and spacious rooms. The pool and jacuzzi has always been clean and the staff is always friendly. It is the place to stay. It is nice to have a mini fridge in each room. Downfall, no microwave in the rooms but one is available near the ice machine. Rooms are hard to find at first. Right on Cheboygan river. Nice view of lots of April snow. Parking lot should have been cleared of snow earlier than 9am. Staff very nice. Room heat was hard to control but room was nice. Breakfast great. Pool and spa were great. "Reasonably priced motel in downtown Cheboygan." We stayed at this motel on our way home from Michigan's upper peninsula. Our room was upstairs, overlooking the small Cheboygan River and houses on the opposite bank. The room was outside access with our truck parked close by. The room was clean, had a wash sink outside of the bathroom/shower, and generally nice. Road traffic outside was noticeable, as the hotel sits on what looks like a main drag. The hotel in near a Walmart that has a Subway sandwich shop inside for a meal that's a compromise between a sit down restaurant and McDonald's. McDonalds', Wendys and Burger are also reasonably close. As a runner, what I liked out this place was it's location. Access to the 61 mile North Central State Trail was about a 5 minute jog from our room. The trail is an old railroad bed that was converted as part of a Rail-to-Trails project. The surface was very nice to run on and I had that section of trail all to myself on th 25 degree Sunday morning. The snow had all melted recently, so the surface required no extra concentration other than to enjoy the run. 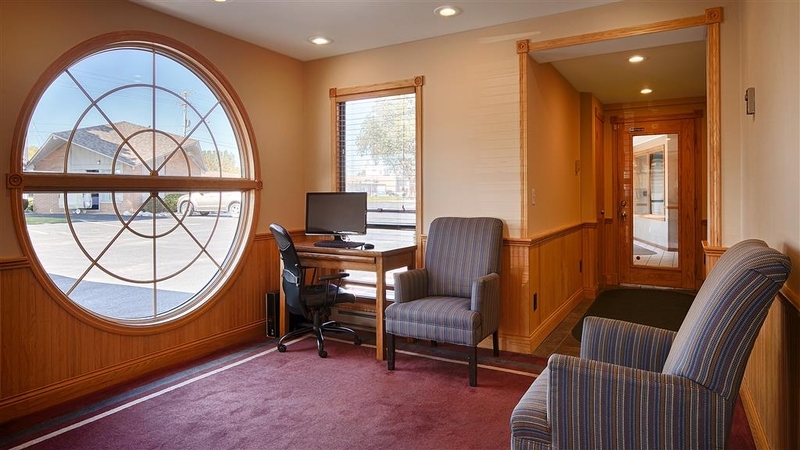 If I find myself in need of a place to stay again in that area, The Best Western in Cheboygan will be my first choice. "Fabulous staff and beautiful rooms with a breathtaking view of the river"
Absolutely the best hotel for the price. Extremely clean, very friendly and very helpful staff. Great breakfast and pool and hot tub! The views from our room where breathtaking of the Cheboygan River. "Best Western River Terrace Cheboygan"
Best hotel in town. Well-run and a beautiful setting. Many rooms have a view of the river. Central location next to shopping and restaurants. Great pool and hot tub. Has been a family favorite for many years. Cheboygan area is great for year-round recreation. Great Hotel and food and cocktails at Mulligans. Goof breakfast and cable t.v. Location was awesome and quiet. Never thought of Cheboygan as a place to recreate at - it truly was a great find. We loved the movie theater and Zany Kitchen! Tattoo artist in downtown had some nice art work. Our stay at the Best Western was fine. It was not my favorite place as far as space in our room. It was a little crowded for 4 people but it worked for what we needed it for. Pool was wonderful however I am glad we swam before the entire hockey team. It was getting a little crowded in the pool. Other than that, the location was great with lots of places nearby. I would love to visit in the summer time. Hotel staff was very friendly, room was clean - great value - breakfast was simple but got plenty to eat - snowed several inches overnight and hotel staff cleaned snow off every car - very nice touch. "Nice place to stay in Cheboygan, Michigan"
This place is close to downtown Cheboygan and right next to the river. There's a nice view of the river from rooms. The hotel is far enough from the street that noise is not a problem, and the rooms are always very clean when we stay there. A Big Boy restaurant an easy walk across the parking lot. If a person has trouble walking up stairs he should ask for a ground floor, since this hotel has no elevator. Otherwise, this should not be much of a problem since the hotel is only two stories high. Currently, they are doing some remodeling on the ground floor so we expect these rooms to be very nice. There's plenty of shopping right across the street, including a Walmart. This is a very nice place to stay. We had a comfortable bed and a room with lots of room to move around. The price is on the high end especially if you are just traveling through and need something for the night. The management was helpful, though, in finding a discount for us. TV, Internet and bathroom were all in great working order. "Cozy mid-winter stay was fabulous !!" This was our first time, and it just looked cozy being on the river. This was WAY beyond our expectations !! It was so very quiet, impeccably clean and close to everything for dinner, lunch, or breakfast !! The beds and pillows were the best we've ever known !!!!!! You just melted into it !!! Will definitely be back !! "Make sure that they are done remodelling, if you want an inside-access room." When I made my res\\servation with the motel directly, I was promised a room with inside access to the pool. When I arrived, I was told that they were remodelling all of those types of rooms. I was given a room at the other end of the motel from the pool, so would've had to walk outside in 20 degrees if I'd used the pool. Best in the area, breakfast is below average but OK. Rooms are nice but internet is hit or miss. Smoking ashtrays are right outside the room so if you don't smoke (allergic) the smell rolls right in. Accommodating staff and probably the best place in town to stay. Shopping for any unforeseen needs is close and easily accessed. Overall, over average. Very clean hotel on a very scenic river. Always a pleasant stay! The staff is friendly and the bathrooms were being updated. New toilets and bathtubs. I would recommend this hotel over any other hotels in the Cheboygan area. I love the river terrace hotel. I always stay at a best western hotel when I travel because of all it has to offer. and the river terrace overlooks the very beautiful cheboygan river. The staff were extremely helpful and courteous. The room was very spacious and comfortable. My grandsons enjoyed the pool too. "Okay Hotel for the price"
If you are just looking for a place to crash on your way to somewhere better it is an alright spot. It, however, is not a destination hotel. This was for an impromptu weekend getaway with my guy last winter where we just drove until we were tired and then stopped for the weekend to enjoy the frozen lake and local shops, it turned out to be a lot less romantic than we envisioned. This type of vacation, lack of planning that is, was probably our biggest mistake. It was noisy in our room from the pool and breakfast traffic and the front desk did not seem interested much in our problem and would not move us. The room was clean and spacious though so that made up for a it a little. I liked the tub quite a bit, plenty of move room in there and the curtain rods are curved out so you do not have to deal with a soggy, used, possibly dirty curtain rod touching you. Over all, it would have been a nice stay had the walls been a little thicker, but since I didn't get any sleep it made the trip rather enjoyable. I was extremely impressed with the quality of the room, compared to the age of the exterior. It did not look run down, just well aged. But the room and pool were a different story the room was in excellent condition, updated and comfortable. The pool area was very nice and clean. I would definitely stay here again. 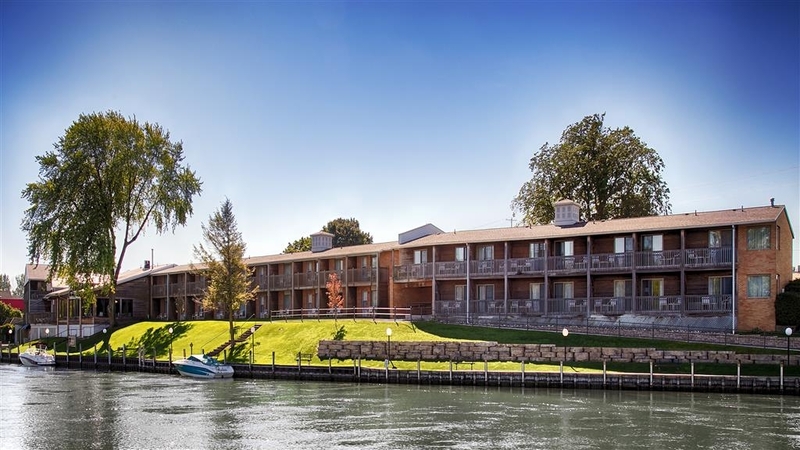 "Best hotel I've stayed in in the northern part of the lower peninsula"
Clean, quiet, nice location along the river, friendly staff, comfortable bed with good linens on it rather than an acrylic bedspread. Had a balcony which would be nice in the summer. We would stay here again. This hotel is great and offers great pricing, too. We had a ground floor room with, of course, a view of the river. We enjoyed the ducks (and one seagull), who would visit from the lawn, quietly cluck/coo, and then leave when we didn't give them any food. Very polite ducks. The hot tub and pool are perfect. The bed was comfy and the room nicely updated. If a microwave resided in the room, we'da been all set. lol I thought the Continental Breakfast was fine. You can't compare it to a Big Boy and be fair. We were happily fed with plenty for breakfast. The front desk personnel was kind and helpful, the groundskeeper was friendly and helpful, the breakfast ladies were too. We enjoyed staying here and will again. this is an older Hotel, but a very nice and clean Hotel, nice room great view it is on the river. We enjoyed our stay, we will stay here again. The hotel is conveniently located on the main road threw town. Every thing was satisfactory with the hotel. The continental breakfast not worth the visit. We went next door to the Big Boy. The cement part of the river dock needs to be replaced. If we would have had ground level riverfront rooms we may have went fishing at the motel. It is in a great location and what a surprise when we discovered that we had a balcony overlooking the inlet waters. I was also pleasantly surprised when we had breakfast, they were smart and left the shell on the boiled eggs. This kept them from becoming rubbery (like the already peeled ones). I would recommend this hotel to any age group. We didn't use the pool but had to pass by it to get to the breakfast area and the appearance was very clean. Nice stay for the price! Super clean, updated, front desk staff and cleaning staff was very nice. We normally stay in Mackinaw City but Cheboygan is only 15-20 miles away. We wanted to stay someplace new and we haven't gotten good service from hotels in Mackinaw City. This place earned our future business. From the staff to the cleanliness of the hotel and grounds is what brings us back to this charm of a place every time. The price is always right, and the service is super. They do have a pool, however we have never used it, looks clean and nice though. We loved the surprise of a wonderful balcony overlooking the river complete with balcony furniture. The hotel staff were very helpful, the rooms clean and comfortable. The breakfast was great with staff assisting and keeping all items available. Good coffee, too! A great stay for us! We did not realize what a gem this hotel would be. We loved that it overlooked the Black River with a great balcony with seating. The hotel was extremely clean and the rooms relaxing and very clean. The hotel personnel were very helpful and friendly. We will definitely stay here again! We loved almost everything about this hotel. The room was clean, the bed comfortable, the view amazing. The wi-fi was sporadic but that could have been because of the area. Great breakfast. The ducks were a minor problem if you wanted to eat outside. Restaurants, grocery store, gas station and shopping were all within walking distance. Everything about this hotel was very good... friendly helpful staff, nice rooms, great location right on the river... only complaint is that the beds were very hard so not very comfortable. But the bedding was nice!